El Morya, Chohan of the first, blue ray of Divine Will and Power helps individuals to recognise their own Divine Will and to connect with our Christ and God Selves. He teaches us trust and courage and to move away from fear, which prevents us from thinking clearing and from accessing our intuition. With faith and trust we can connect with our Divine Mission and life purpose and move forward with self-confidence and courage. El Morya works with leaders and rulers and with people in positions of authority, helping them to lead with discernment . As Master of the Council of Darjeeling, he teachers leaders in the ways of Divine Power, with many of the world's statesman joining him during sleep time at his etheric retreat in Darjeeling. Many of his past embodiments show life times of total devotion to God, which on several occasions lead to his death. Many life times were also as powerful leaders, but where he attempted to be fair to his people. He is a strict and exacting teacher, expecting hard work, obedience and self-discipline from his students - yet he also has a witty and quick sense of humour. "I will, To will, God's Will"
Amerissis, the Goddess of Light, also known as The Lady of the Lake during his incarnation as King Arthur. Located in the etheric realm above the foothills of the Himalayas above the city of Darjeeling, India. Under the master El Morya, the Brothers of the Diamond Heart who serve at this retreat assist humanity's endeavours by organizing, developing, directing and implementing the Will of God as the foundation for all successful organized movement such as governments. Many of the World's leaders and statesmen /women visit this retreat during their sleep time for direction and teaching by the Darjeeling Council and in so doing El Morya as the chief of the Darjeeling Council, serves with ascended masters and unascended chelas to bring about the will of God in the affairs of nations. "on the first floor, we are shown the main auditorium. At the far end is the focus of the diamond heart, ministered unto by the devas and Brothers of the Diamond Heart. On a raised altar there is a pale-blue diamond with a delicate blue flame encompassing the white flame that is visible in the center of the diamond." Image of the Darjeeling retreat. This retreat is situated only half a mile away from the retreat of El Morya's guru Elohim Hercules' retreat at Half Dome, Yosemite Valley. 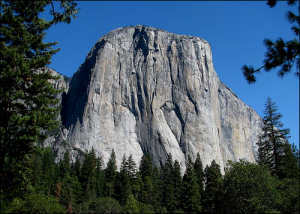 When viewed in certain light the rocks of El Capitan show a large face. 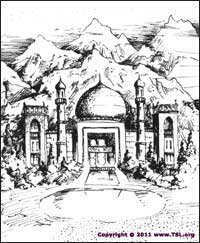 Many believe this to be the image of El Morya. Visits to this retreat can help bring the Power of God into North America. El Morya also tends a planet in another solar system called Excelsior, where he nurtures life waves of souls who have not been corrupted by the fall of the angels. This brings him great comfort and a reprieve, especially when tried by the intense challenges that are so prevalent on earth. El Morya has had many lifetimes where he has shown a pattern of tolerance and great statesmanship and leadership, and also demonstrate his intense courage and steadfastness; faith, trust and belief in the ultimate Power of God, and in the integrity of all Spiritual Law. He upholds these Laws above all others, and has absolute determination to carry out God's Will. Written about in Genesis the first book of the New Testament. Considered the first Patriarch of the Jewish people . He founded the 12 tribes of Israel .He is also recognised as a great patriarch in Christianity and Islam. Born as Abram. As a nomadic leader he was the first to recognise and teach the existence of only one God, who promised him that he would be the father of a great people if he did as God told him. God set him several apparently impossible tasks, which Abram completed without question in pure devotion to God.The ultimate test of Abraham's obedience, was when he was asked to sacrifice his son Isaac. God had promised that Abraham's descendants would come through Isaac, so the level of faith he displayed was extraordinary. Abram trusted God and at the very last minute, as his son was about to be sacrificed, an angel intervened and replaced Isaac with a ram, to be sacrificed instead. As a result of his obedience, God changes his name to Abraham, meaning 'father of the people'. One of the Three Wise Men who paid homage to the Christ Child. He is believed to have brought the gift of frankincense, which is used commonly as an incense in churches. It helps to connect the person with the higher spiritual realms by opening and balancing the crown and third eye chakras. He is believed to have been a Persian Scholar. King of the Britons. He created of the Round Table, where all had an equal position and say. His knights (of the Round Table) were reputed for their bravery in battle and service to their King and the Kingdom of Camelot. King Arthur created a society based upon respect, justice, courage and truth and led his Knights on the legendry quest to find the Holy Grail, believed to have been placed in Glastonbury.by Joseph of Arimathea. Archbishop of Canterbury (1118 - 1170) during the reign of King Henry II. During this time the Catholic Church, headed by the Pope in Rome, had great powers within England, for example it oversaw many of the courts of law. King Henry felt that some of the church's powers were superior to his own authority and this led to a conflict of opinions between he and Becket, since Becket remained defender of the church, which made him at odds with the king. Eventually Becket paid for his stand against the king. He was slain in his own cathedral by four knights performing the king's bidding. Shortly afterwards he was made a saint by the Pope. Saint Thomas More (1478 - 1535). Chancellor of England, during the reign of Henry VIII. For many years More was a close friend of King Henry and this was recognised by several promotions by the king. However, More was a steadfast Catholic. He did believe that parts of the church needed reforming and modernising, but the changes should come from within the church itself and this put him at odds with the King, who was determined to reform the church and establish a Protestant church of England with himself as head. Eventually laws were passed that meant only the King could authorize and rubber stamp changes. More resigned his position. In 1534 the Succession Act was passed, which required More to take an oath that repudiated the Pope and recognised the marriage between Henry and Catherine of Aragon and their children as heirs to the throne. More refused to take the oath. This was considered as treason so he was arrested, placed in the Tower of London, and finally beheaded on July 6th, 1535. Akbar, born a Muslim, was raised in the rugged country of Afghanistan, where he spent his youth learning to hunt, run, and fight and never found time to read or write. He was the only great Mughal ruler who was illiterate. Although illiterate, he was a great seeker of knowledge and had his courtiers read to him. He was a great conqueror, diplomat, organiser and administrator. He established fair taxation and government systems and encouraged art, literature, music and architecture . He had an interest in all religions and had liberal policies towards non-Muslims. Akbar tried to establish a new religion known as Din-i-Ilahi. He invited spiritual leaders from many different faiths to work together, to find common ground within their faiths. Unfortunately after several years of discussion, ego reigned supreme and the united religion floundered and the spiritual leaders returned to their own homes and separate religions. The expression "Allah Akbar" is believe to have come from these times. Commonly translated as "God is Great", it also means "Akbar is Great". Born in Dublin to a poor background. He was recognized as a national poet and hero because of his popular acclaim as a representation of the identity, beliefs and principles of the Irish culture through his music and poetry. At Trinity College he met members of the United Irish Society and had a passion for the national cause because of his Catholic background. He became a member of the Historical Society at Trinity and several of his friends were involved in uprisings. He refused to inform on them. Later he studied law in London. He had major success as a society figure in London, and in 1803, he was appointed registrar to the Admiralty in Bermuda. From there, he travelled to Canada and the United States. During this embodiment, El Morya deliberately wrote poetry to soften and re-balance his nature since many of his previous embodiments he had been in a position of ruler and at times found his own will too autocratic. Little actual factual detail is known of the life of El Morya Khan. It is understood that he was born as the Rajput prince El Morya Khan during the 19th century, in the Indian class of warriors and rulers esteemed for their courage and honour. For many decades he held an authoritative position in Indian affairs. He was one of the most renowned of the Tibetan mahatmas, known as Master M or "Mahatma of the Himavat". 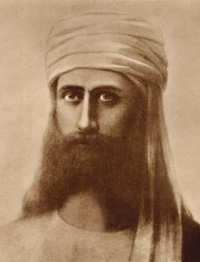 EL Morya retired to the Himalayan mountains with his spiritual brothers Koot Hoomi Lal Singh (Kuthumi) and Djwal Khul to pursue spiritual adeptship and for the most part, preferred to remain unidentified by the outer world. Together they embarked on the mission to bring eastern mystical understandings and teachings into the western world, mainly through personal letters, rather than actual appearances. Through Madame Helena Blavatsky they brought occult mysteries to a larger body of mankind and helped establish the Theosophical Society. Through the Theosophy Society, these Masters not only brought the ancient teaching of Hinduism and Buddhism to the west but they also brought about the rebirth in India of its ancient history, language and national spirit. This later inspired the "Home Rule" movement that brought Gandhi back to India and the non-violent social movement that eventually led to India's independence. This in turn inspired the home rule movement in Ireland. 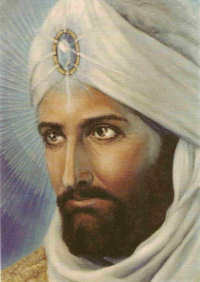 In 1898 El Morya ascended and left his physical incarnation. 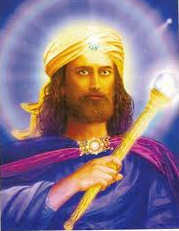 He continued his work from spirit as the Ascended Master El Morya. In the first half of the twentieth century, El Morya worked with Helena and Nicholas Roerich to found the Agni Yoga Society. He dictated several books in English and Russian, in order to bridge the tyranny spreading across Europe in the first half of the twentieth century. Nicholas and Helena Roerich began the movement of Pax Cultura to protect world culture, art, architecture and music from the ravages of war. The mystical paintings of Roerich open our eyes to a world of beauty, meaning and mystery as they depict our Teachers, our spiritual heritage, our history and our future. In the 1950s, El Morya worked with Mark Prophet and later his wife Elizabeth Clare Prophet. He dictated many notes and books to them. He encouraged them to establish The Summit Lighthouse whose mission is to spread the light of the Ascended Masters' teachings to all mankind. 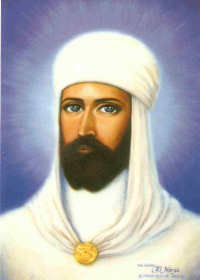 In 1975 El Morya dictated " The Chela and the Path" to introduce seekers to the spiritual quest to the path of initiation of the Great White Brotherhood. Today he continues to connect with many people throughout the world and to guide and teach the meaning of truth and Divine Power.